High-performance products for sending digital or analog computer, video, and audio signals to multiple devices. - 2K & 4K Support. - Default EDID − For fast and efficient connection. 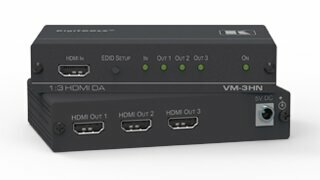 VM-4HDxl 1:4 3G HD-SDI Video Distribution Amplifier 1 3G HD-SDI 4 3G HD-SDI - Max. Data Rate − 3Gbps. - 2 RGBS - Bandwidth − 500MHz (−3dB). - Rack Kit − RK−1.